This is a calling card to unvegans the world over. 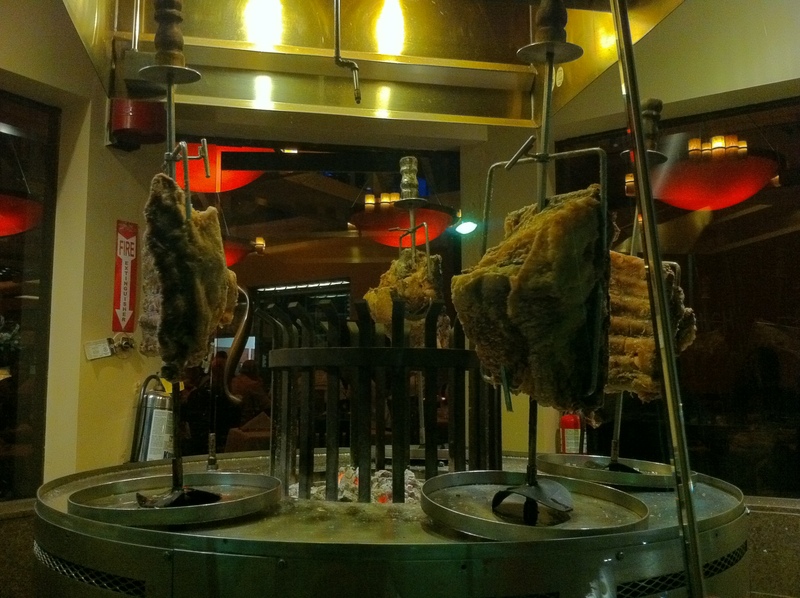 Ever since beginning my meat blog, Fogo de Chao in Beverly Hills has been in my sights. I’ve eaten Brazilian food before, but I have been told over and over again that Fogo is the king of meatiness. But it’s expensive. Like a fixed price of $56.50 expensive. 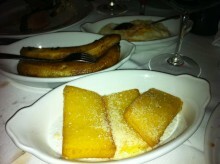 But when Restaurant Week comes to town, that ridicu-price drops down to a more reasonable $44 bucks, including dessert. So for my first Fogo experience, I made sure to go during Restaurant Week and was amazed with what that price bought me. 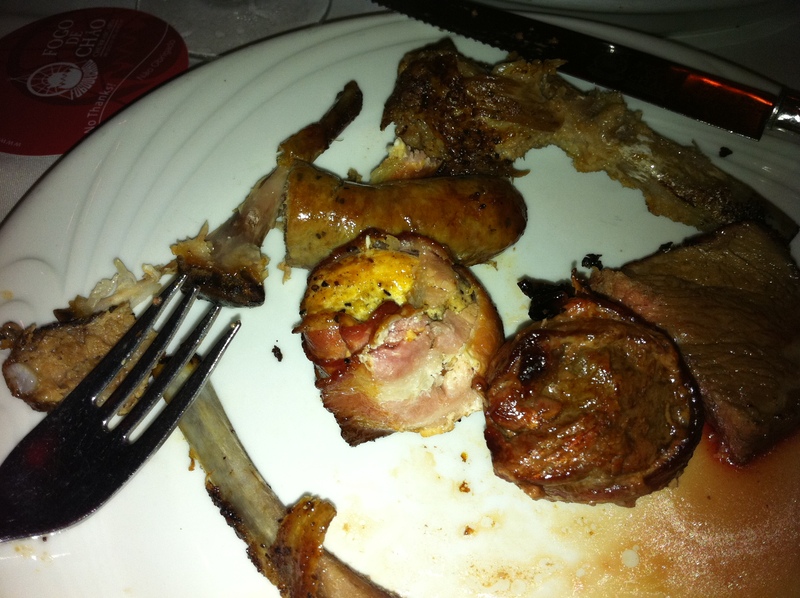 Fogo de Chao boasts a selection of 15 different meats. This doesn’t mean 15 different animals, but 15 different cuts of meat from 4 different animals. The animals are pork, chicken, beef and lamb and the cuts are called picanha (top sirloin with garlic or just regular seasoning), filet mignon, beef ancho (rib eye), alcatra (more top sirloin), fraldinha (bottom sirloin), costela (beef ribs with garlic), lamb chops, leg of lamb, bacon-wrapped chicken, chicken drumsticks, costela de porco (pork ribs), lombo (pork loin crusted with paremesan), linguica (sausage) and finally bacon-wrapped filet. Wow, that’s a lot of meat. Mere distractions, but tasty ones. 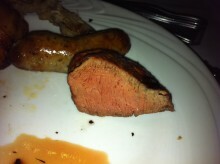 But before I get to my own meat-eating, I’d like to talk about Fogo’s attempt to trick customers. You see, they have a huge salad bar and it’s not your average unvegan unfriendly salad bar. Sure, there is lettuce, but there is also bacon, cheese, bread and delicious-looking cold cuts. I avoided this area at all costs and figured I would pay it a visit in case I had stomach room after consuming my weight in meat. They also try to distract you with starchy sides like mashed potatoes, fried polenta, fried plantains and cheese-stuffed rolls. Fortunately I have an iron will and managed to avoid these until after the meat as well. 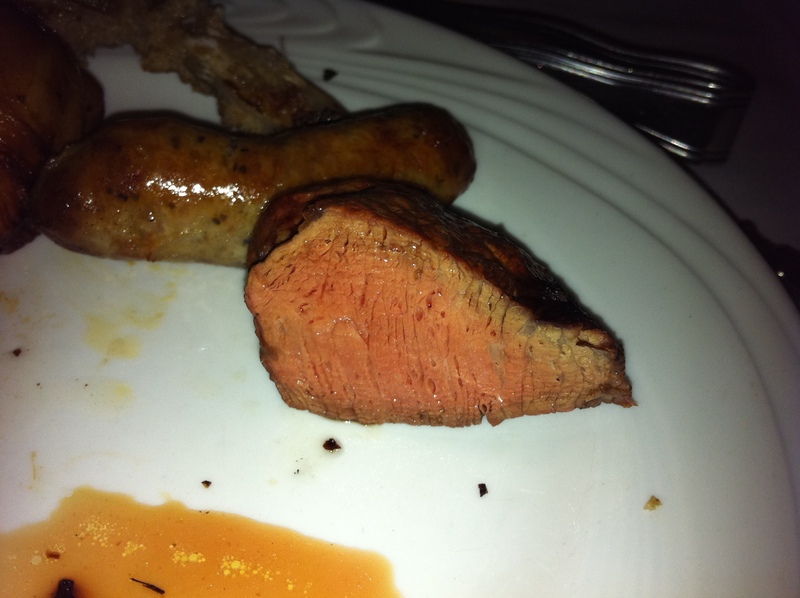 A filet next to some sausage. Now, the Brazilian Churrascaria is no ordinary buffet. Instead of doing your own work, people come around with skewers of meat to slice off for you. Buy how do they know you want food? Great question! Every diner is given a coaster-shaped disc with green on one side and red on the other. If the green side is up, the food comes. If red is up, the food stops. There is no yellow, so when it rains meat, it pours meat. 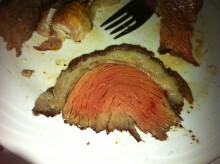 Picanha: not just a pretty piece of meat. Honestly, I can’t get into each individual meat. Partially because I don’t have enough room to write, but also because at some point the meats begin to blur together. Overall, I ate 14 of the 15. Yes, somehow the garlic picanha escaped me, which is a shame because the picanha was my favorite cut. It was moist, tender, juicy and flavorful. In sure a lot of the flavor came from the huge layer of fat surrounding the thing and for that I was happy. They call it the house special, and with good reason. The filet was also delicious and I surprisingly found the bacon-wrapped chicken to be better than the bacon-wrapped filet. The flavors just seemed to work much better together. Some beef ribs, pork loin, and other meaty glory. The beef ribs were tasty and the pork ribs fell right off the bone and into my mouth. 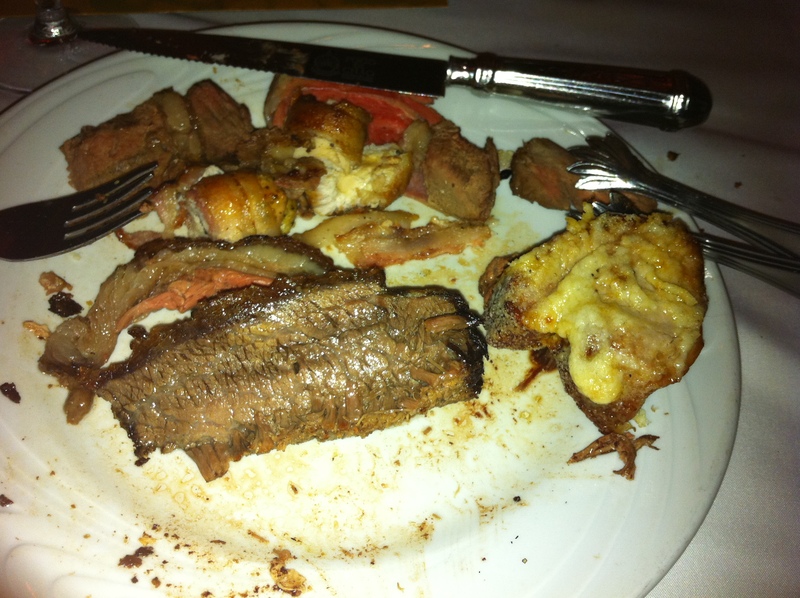 The assorted sirloins were decent, but seemed like a waste of space compared to the picanha and filet. The same went for the lamb and sausage. They weren’t bad. Really nothing was bad, but I only had so much stomach space and wanted to fill it with something better. About midway through, the meat gave me the dizzies, but I rallied and finished with a stomach stuffed with meaty deliciousness. I even had a little space to offer to the sides. Each of them were tasty, but I was glad I had concentrated on the meat instead. 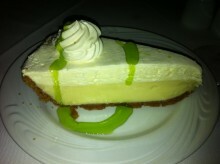 The key lime pie to wash it all down. The dessert was pretty good, but I honestly couldn’t be a very good judge at that point. I ordered the key lime pie and also tried the cheese cake. The cheese cake was better, but again at that point in the meal, my tastebuds were so savory that any sweetness tasted like it came from a different planet. In the end, I was one full and happy unvegan. 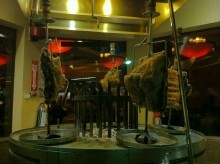 Fogo de Chao is truly a meat-lovers paradise, as long as you are a meat lover that can afford it. Restaurant Week is definitely the time of year to do it, because even though it only comes twice a year, it would be pretty tough (and too delicious) to handle Fogo de Chao more than that. Great piece! I still have sweet dreams and beautiful nightmares of Fogo. If you need other pics, I have some on my camera.